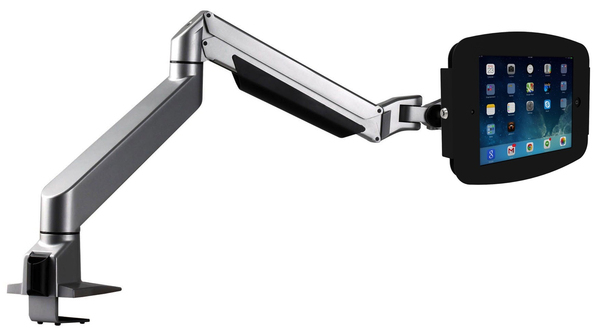 Allow your work space to “Reach new heights” with the Space Reach iPad Articulating desk mount. 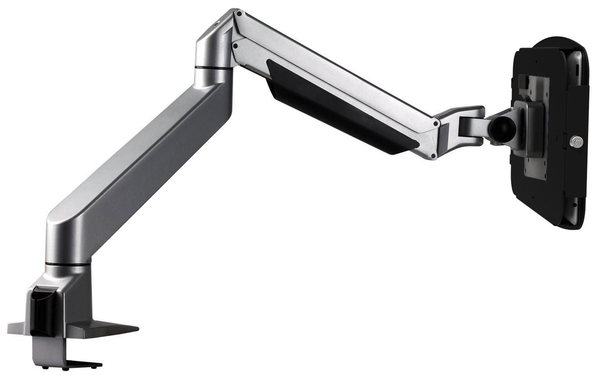 Tilt, swivel, extend and retract your iPad with a smooth gliding motion that can be easily adjusted to your liking. Click the Space iPad Enclosure into the cradle and free your hands to use a wireless keyboard or other Bluetooth devices. Adjust the screen so you can work comfortably or share information while your iPad floats above your desk alongside other screens and devices. Setting up the Reach Arm is quick and easy with a no-screw tightening clamp. First fasten the base to the surface edge, then connect the arms to the base. Before you put your iPad into the enclosure, screw on the VESA Click plate to the back plate of the Space. Once the Space iPad enclosure and Reach arm are set up, you can lock in your iPad. Wire the included security lock through the cable management system and loop the end to a table leg or anchoring point. The Reach is the perfect desk companion for any business or home environment including: Retail, Laboratory, Garage, Classroom, Kitchen, Hospital, Clinics, and many more!